Find out what’s on in Galway with our event guide featuring the best events in Galway city and county. This guide lists events at a glance, showing what’s on each month. Celebrating Galway as a good food destination, 2018 will be the 7th year of the Galway Food Festival and is sure to build on the success of the 2017 event. The festival will promote good food and good food outlets in Galway, as well as showcasing food producers based in Galway and in the West. The festival takes place in April primarily as it is the time of year when some of the best local ingredients become available, such as Connemara Spring Lamb, and trout and salmon caught locally. Clifden Traditional Music Festival is a weekend of the very best of Irish music, song and dance with concerts, sessions, workshops and outdoor entertainment. The 2017 festival was a great success with the town filled with music and excitement throughout the whole weekend. The festival includes Music Workshops, Sean Nos Dance Workshops, Youth Sessions, Traditional Music Mass, Pub Sessions throughout the whole weekend, “Farewell Session” on Sunday. Taking place on the first Tuesday of each month at 1.10pm in St. Nicholas’ Church, the Lunchtime recital @ St. Nicholas’ Church is a popular and long-standing event which caters for all tastes and interest levels in classical music from the novice to the professional. Each month will feature The Galway Ensemble in Residence, ConTempo Quartet string quartets from their repertoire. All performances are preceded with a brief introduction of the music. Dancers, activists and academics from around the world will attend the seventh Galway Dance Days Festival at the Black Box and other city venues. The 14th annual Rás Chonamara takes place over the Easter Bank Holiday weekend. In aid of Galway Autism Partership the route goes right through the heart of Connemara. 2018 is the 17th Connemara Marathon and a celebration night will be held in both Galway and Clifden. Comprising of a Half Marathon, a Full Marathon and a 39.3 mile Ultra Marathon all taking place in April. Book early to avoid disappointment. As part of Galway’s designation as European Region of Gastronomy 2018 the touRRoir Global Forum comes to the National University of Ireland this year. The forum is a cross sector global business forum bringing together Food, Tourism and Culture experts to discuss how, through the inextricable link of these three sectors companies can grow business, local communities can flourish and destinations can ensure a more successful and sustainable economic future. Connacht play host to Leinster at The Sportsground in the Guinness Pro12. Kick-off TBC. The Clare Island Adventure Race will appeal to both experienced and novice adventure racers as there are two options available. For the experienced racer the full length course will be the perfect warm-up race for a busy season ahead. With the climb of Knockmore, this race is no picnic and will present a serious challenge even to seasoned adventurers. For beginners the Spirit Race omits the climb of Knockmore, and has a shorter cycle, making it very doable although still reasonably challenging. The Night Rider sportif takes place at night along the quiet roads of Connemara where no light-pollution from street lights exists. Starting just before sunset you will cycle into the darkness. Choose from 100km and 68km distances along this beautiful and rugged part of the Wild Atlantic Way. The Bealtaine Festival 2018 will see hundreds of events for, by and featuring older people all across Ireland, offering theatre, visual arts, music and more. This year’s theme is ‘And catch the heart off guard’ from Seamus Heaney’s poem ‘Postscript’. The Bealtaine Festival is Ireland’s unique nationwide celebration of creativity as we age and is an initiative of Age & Opportunity. The Inishbofin Community Arts Festival takes place on the May Bank Holiday 2018. Situated on the stunningly scenic and historic island of Inishbofin, this Arts Festival is a colourful and eclectic mix of music, dance, visual arts, crafts, heritage, poetry, creative workshops and fun family activities. The Galway Theatre Festival, now in it’s 10th year, will take place throughout the city with the inclusion of more venues than before including An Taibhdhearc, Druid Lane Theatre, the Town Hall Theatre, and of course, the Nuns Island Theatre. Galway theatre companies feature heavily in the programme with Blue Teapot, Mephisto, Fregoli, Moonfish, and Vagabond all involved. A celebration of Killary Mussels harvested from “One of the Forty Places to See Before you Die” takes place on the glorious Renvyle Peninsula in North Connemara. This is the 10th year of the festival and promises that more mussels will be eaten here this weekend than in any other part of the country. Last year, over a ton of mussels were eaten and organisers are set to harvest three tonnes of Killary Mussels for this year’s celebrations, which include music, fun, mussel cooking competitions, children’s treasure hunts and set dancing, to name a few. Ed Sheeran plays two major outdoor concerts at Pearse Stadium on the 12th and 13th May as part of his nine date Irish tour. All concerts are sold out with the 300,000 tickets sold setting a record for a musician’s Irish concerts. The Banff Mountain Film Festival promises an evening of extraordinary short films at Galway’s Town Hall Theatre, from the world’s most prestigious touring adventure film festival. See some of the best mountain films of the year, featuring the people who live, play and enjoy those area through high adventure, humor and a love for the great outdoors. Gospel Rising Music Festival is a fun, energetic and inclusive event taking place in Galway City’s West End area, and at the Black Box Theatre in mid-May 2018. Organisers are calling on all gospel music enthusiasts to join us in Galway City, to celebrate and experience the continued rising of gospel music in Ireland. Whether you enjoy playing or singing gospel music in a choir or just in the shower, this is your chance to experience it for yourself through workshops and gigs over a jam packed weekend festival. We are inviting anyone who has ever sung or wanted to sing in this really fun style. Maybe you are in a choir, or you once were, and now is the time to come and try it again. The town of Tuam in County Galway will host the Fleadh in 2018. The Galway County Fleadh feature a wide variety of events including competitions, traditional Irish music sessions and dancing. The Galway Early Music Festival celebrates its 22nd birthday in 2018 with old world music and arts and features concerts, workshops, street performances of music, dance and historical re-enactment. The Connacht Shearing Festival in Corofin, Co. Galway hosts a competition attracting competitors from all over Ireland and some travelling from UK shearing over 1,000 sheep on the day, so come and see the speed and skills of some of the top shearers in the country. The event also includes the Connacht Dog Show, massive Tractor Run, Trade Stands, Brown Bread Baking Competition, Bonny Baby Show, Amusements much more. The rich diversity of African films, animations, shorts, and documentaries, offering both entertainment and a fresh perspective on life in the continent, will be on show in Galway. The 11th Galway African Film Festival takes place from Friday to Sunday in NUI Galway’s Huston School of Film & Digital Media, Earl’s Island (across from the Cathedral). The films concentrate ways of finding and creating identity in familial, social, and political situations. Some focus on individual adventures, others on social struggles. The 5th Clarinbridge Banjo Gathering is a weekend of traditional Irish and Bluegrass Music, banjo exhibitions and workshops. All events are free (except workshops) and all instruments are welcome at music sessions. The International Galway Burlesque Festival is a celebration of the diverse, creative, seductive world of cabaret and burlesque, featuring top performers from across the globe, converging on the Creative Heart of Ireland in a flurry of feathers, fans and fabulousness! The annual Conamara Bog Week 2018 festival takes place in the Quaker village of Letterfrack. This is the 34th year of the festival and the organisers Conamara Environmental Education and Cultural Centre are promising an exciting line up as usual. The ‘Fever Pitch Music Festival’ takes place on the Bank Holiday Weekend, with UB40 and Rudimental already signed up as headline acts with more to be annoucned. The event will also feature a food village, comedy tent and silent disco, as well as a full bar, and it will run from 2pm to 11pm each day. Cong Food Village Festival showcases the wonderful produce of the West in a fun and educational way. Cong is passionate about food and are delighted to be able to share this passion with you. The program is packed with great events across the three days which will include an official opening in Ryan’s Hotel with a pig on a spit, the festival marquee, storytelling, while there will also be talks on nutrition, foraging, food awareness and healthy eating advice, alongside beer tasting, street food and cooking demos. The ‘Carlsberg Salthill National Fives’ annual tournament, now in its 42nd year has become a highly anticipated date in Galway’s soccer calendar and sees a great mix of Galway natives, visitors and friends gather to enjoy this great footballing festival. This fun cycling sportive in support of Croí. Cyclists will have a choice of a 27.5 mile or a 75 mile route through the picturesque setting of Connemara. We will provide roadside assistance, support vehicles & plenty of refreshment stops along the way! With a programme of events for everyone to join in, learn more about wildlife and the cultural heritage of the island as well as experience the special charm and qualities of our offshore islands. This is a great opportunity for locals and visitors to experience the unique natural heritage of the island and help in recording the great range of species present. The Great Galway Bike Ride is set to transform Galway on the final Sunday of Galway Bike Week. Organisers expect that 1,500 cyclists from all over the country will pedal their way through the city and outlying areas. The cycle routes include the 30k Bearna Loop, the 60k Spiddal Block , the 100k Shan route and the more challenging 125k Gran Shan which will take cyclists through the spectacular Connemara landscape. The Irish Workhouse Centre in Portumna are hosting the annual ‘Fit for Fun Festival’. It promises to be a fantastic weekend with lots to interest all ages – from Lego and activity workshops and an exploration dome for children, to a charity cycle (with the Lions Club) and heritage events for adults. The Clifden Lifeboat Sky Road 10K race starts and finishes in Clifden, Co Galway and will bring you up the Sky Road which is one of the most scenic areas in Connemara. The course is officially measured and as in previous years AAI approval will be applied for. Individuals and teams of runners, walkers, joggers and stragglers of all abilities are welcome, with prize categories to suit everyone. All funds raised go to the Clifden RNLI. This year’s Galway Regatta will take place at the NUIG grounds at Dangan. Galway’s oldest rowing regatta, this year it celebrates its 134th anniversary, and once again entries from all four provinces with many of the top rowing clubs in Ireland are expected to compete. The Galway Sessions Festival returns celebrating Irish folk and traditional music and the music Irish emigrants brought with them across the world. As in previous years, the festival’s Scottish connection will be retained with an array of performers travelling from Galway’s cultural partner Stirling to take part. Events take place in the Town Hall Theatre and in pubs throughout the city with sessions planned in predominantly in The Crane Bar but also in The King’s Head, Tigh Choili’s, Taaffe’s Bar ,The Quays, Tigh Neachtains, and Monroe’s Tavern. The Galway County Show will be held on the 17th and 18th June at Galway Racecourse in Ballybrit. Saturday is Showjumping only. Sunday 18th June is a super family day with showjumping, showing section for Connemara ponies, young horses, ridden hunter section, IPS, side saddle, cattle, sheep classes, sheep shearing, dig section, tractor run, stands, children’s section. The Oughterard Trails Festival aims to highlight the wonderful walks on our doorstep and to encourage visitors and locals alike to get outdoors and explore! The festival takes place over the last weekend in June and aims to attract tourists and day-trippers to enjoy the village of Oughterard. Galway Garden Festival is held in the beautifully restored Claregalway Castle in early July. Nursery suppliers from across Ireland will share a wealth of planting experience with all who browse the plant stalls’ extensive range of plants, trees, seeds, and shrubs. Garden equipment, from hoes to glasshouses to woven willow baskets. Celebrated gardeners will provide advice and the work of organisations such as Bóthar, The Beekeepers Federation, and The Organic Centre, Co Leitrim, can be appreciated at the stands in the castle grounds. The Sunrise Children’s Festival at Brigit’s Garden is a family friendly weekend festival with camping in the beautiful surroundings of Brigit’s Garden and woodlands in Rosscahill, Co. Galway. The festival will feature a full two-day programme of live music and theatre, a circus show, puppet shows, storytelling, yoga, a fire spectacular and more, in three tented areas. There will also be lots of delicious artisan food stalls along with the garden café and bar (only for grownups!). The 12th Annual Roundstone Connemara Pony, Dog & Sheep Show takes place in mid-July, 2018, at the Showground. The main event, the Connemara Pony Show, consists of 20 in-hand classes showcasing all ages and varieties of Connemara Pony. A Dog Show and Sheep Show are also included in the day’s events. A great day out is assured for competitors and spectators alike. The deadline for entry is late June. Film festival for feature films and shorts. 2018 marks the 30th Galway Film Fleadh, and the central goal of the festival remains unchanged: to bring together audiences and filmmakers within an intimate environment and share a common experience. One of Europe’s most inventive, vibrant & colorful events. A truly international celebration of the performing and visual arts which takes place in and around Galway City each July. 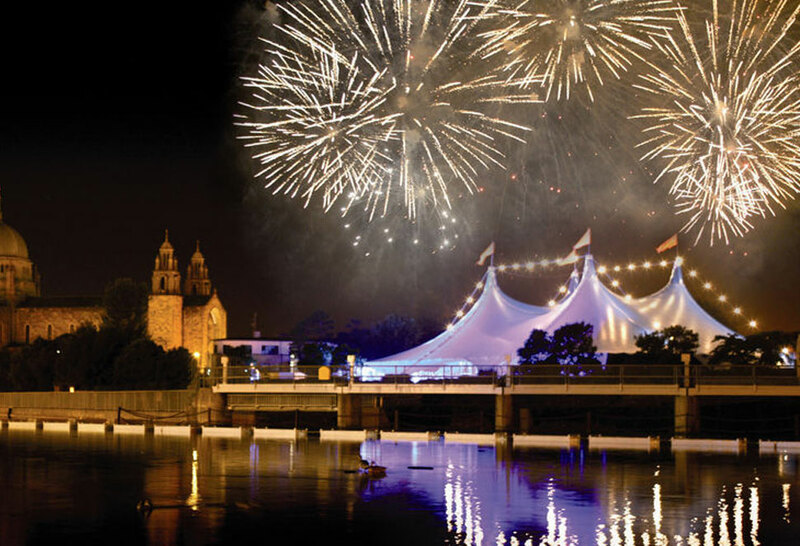 From awe-inspiring visual arts to tantalising theatre, giant puppets snaking through the medieval streets to late-night musical parties in the Big Top, this Galway festival is fabulous from start to finish. Fresh from thrilling sets at some of the UK’s biggest venues in 2017, Kodaline return to the Festival Big Top on the 19 July 2018 at 8pm. British ska-pop legends Madness will play a concert during the Galway International Arts Festival and Róisín Dubh presents…’ concert at the Festival Big Top, Fisheries Field, on Friday July 27. Double platinum selling alternative rock band Caribou to play the Galway International Arts Festival Big Top on the 28th July 2018. The race has three disciplines: Trail / Mountain Running, Kayaking and Cycling. The course is in the stunning scenery of Connemara, so now all that’s needed is a bit of nice weather. Gaelforce Women’s Adventure Race is 27km in total and it is open to female racers of all levels. Galway’s most popular athletic event, the Streets of Galway 8k Road Race event will take place in mid-August 2018 at 7pm and include more than 3000 entrants. It starts on Fr Griffin Road, winds its way through the city’s streets, follows a course out around Salthill, before taking in the delights of the prom on the way to the finish in The Claddagh at South Park. The annual Galway Pride Festival takes place every August throughout Galway City. This new event will encompass everything that makes our city the cultural magnet that it is. The aim is to encourage involvement from the wider community, and to highlight the great variety of people that make Galway such a vibrant and exciting place to live and visit. Events throughout the week will include evenings of information and awareness, arts and performance, music nights and the colourful parade on Saturday 20th August. The Galway Pride Festival committee would welcome expressions of interest from people wishing to take part in the festival, from street entertainers to volunteers. The Inishbofin Maritime Festival will expand on the successes of the recently rejuvenated Inishbofin Currach Regatta, extending the programme to include yachts, púcáns, sailing dinghies and much more! The Great Spin Out West (GSOW) is the fastest growing cycling sportive in Ireland. Now in its 7th year, it takes place every August in Connemara, Co. Galway. In just a few years over 500 people of all ages and ability have cycled the GSOW with all proceeds going toward Cancer Care West, a west of Ireland focused charity. Starting and finishing in Oughterard in August 2018, the 125 km route takes in some of Galway’s most scenic views. The Super Milk Wild Air Run at Galway Racecourse is a sporting experience not to be missed. The run involves climbing up, sliding down, bouncing and jumping your way along a 5km inflatable obstacle course which includes a 60 Metre Long Inflatable Water Slide!! People from 7 years to 70+ and of all fitness levels can enjoy Ireland’s biggest inflatable obstacle course. The Étape Connemara is a 150km cycling sportive which will take place in August 2018. This is a chip-timed event on open roads in Connemara. The event is organised by Croí, the heart & stroke charity, with all proceeds going back to the charity.. The Corribdale Pony Show & Country Fair is a great family day out with activities such as in-hand ponies, riding classes, a dog show, vintage show, sheep racing, BBQ, craft stands, childrens inflatables, zorb balls and more. All proceeds going to Cancer Care West & Galway Hospice. Non-Adventure Olympic and Sprint Distance Triathlon in the most stunning location imaginable. Both distances start with a swim in the clean deep blue water of Killary Fjord. The cycle routes follow the Connemara coast passing lakes, stunning beaches and small Connemara villages. Both distances finish with a run into the picturesque village of Leenane. 2017 proved very successful as our first year of Connemara Triathlon. It really is the triathlon not to miss in 2018. Ballinasloe, Co. Galway will be alive with Traditional Irish Music, Culture and Heritage for Féile Cheoil Larry Reynolds. The weekend has a packed itinerary including Trad Music, Song & Sean Nós Dance workshops followed by a Tutors Recital, an Irish Music Pub Trail, a Lecture on The East Galway Style of Music, Craft Exhibitions, Schools Art and Poetry Competitions. The Cannonball convoy is expected to return to Galway with some of the top supercars in Ireland taking part. Cannonball Ireland is the annual gathering of supercar enthusiasts who drive in convoy on an adventurous and picturesque road trip around Ireland, raising funds for charity. The longest running community arts festival in Ireland, Clifden Community Arts Week, now in its 41st year yet again promises to have something to excite everyone in this years programme. Audiences can expect a very high quality artistic programme with a superb literary, musical and visual art content which again will have the community arts of Clifden and the surrounding hinterland as a central focus with creative writing, music, theatre, graphic design and film workshops and performances taking place in the local schools for the duration of the festival. The event is now in its 13th year provides free access to museums, galleries, theatres and public buildings is provided from 5pm until 11pm offering tours, exhibitions, readings, performances and films. Drama and poetry, music and dance, workshops and lectures, all free of charge. The year is the 3rd Carna Walking Festival which provides walking and hikers of all ages the opportunity to explore the wild and rugged coastline of southern Connemara. Organised walks include visits to the sacred St. MacDara’s Island, to the deserted Feenish Island, a climb up Cashel Hill (311m) and a bog walk to Loch Scannive and it’s historic crannóg. Galway is expected to host National Hot Air Balloon Championships in September 2018. 40 competing teams will come from all over the world – including USA, England, Scotland, Wales, Northern Ireland, Italy, France and Spain – and plans are advanced for the mass launch of all balloons, night glow and schools visits. The event will take place all over the county in different locations depending on wind direction – but Loughrea will be the base. An extravaganza of all things equestrian, with entertainment, music and great family fun, the 176th Ballinasloe International October Fair & Festival is held in the town of Ballinasloe, County Galway. The equestrian days are Saturday, Sunday and Monday. On the Sunday and Monday, the Fairgreen is the place to be, with every breed of horse and pony on display from the beautiful Connemara Pony to trotting ponies and wonderful Irish draughts. With an assortment of fun events, street stalls, fireworks, tug-o-war, street & vintage parade, arts & crafts, music and children’s events, there’s a sense of community about the show, but with around 85,000 visitors a year the word has spread. Dive in at one of the most majestic settings along the Wild Atlantic Way, Killary Fjord. The The Great Fjord Swim is an open water swimming event with distances to suit all swimmers and a boat ride to the start line. Visitors are welcome to the authentic Irish community of Inishbofin Island to join in a host of hands-on food related events. With beer making and foraging sessions planned, as well as panel discussions and cooking workshops with some seriously skilled chefs, you’ll find yourself fully immersed in unique, natural surrounds. In touch with nature, you’ll learn to truly savour the pure essence of each ingredient and tasty dish. The Galway Jazz Festival returns for its 13th year, with shows to be held in An Taibhdhearc, Druid Theatre, The Black Cat in Salthill, the Meyrick Hotel, The Electric Garden, various schools in the city and county, as well as public spaces around the city. Sky Road TV & Film Festival is now in its 6th year and takes place at the Station House Theatre, in Clifden, Co Galway. The aim of Sky Road TV and Film Festival is to give Irish film makers a better opportunity to screen their content at festival level. The Galway Comedy Festival under the new name ‘Vodafone Comedy Carnival Galway’ has grown since its beginning in 2005 to become a major event on the comedy circuit in Ireland, regularly attracting big international names to the city for week leading up to and including the October Bank Holiday weekend. With several shows each day and night, with comedy show for children too, you are guaranteed to see well known comedians both Irish and international –and a decent number of ‘faces from the telly’ there. The Burren Food Fayre is an annual food themed event in Lisdoonvarna over the October bank holiday weekend at Halloween, showcasing the fabulous produce of The Burren through workshops, food stalls, competitions and chef demonstrations and more. The October Racing Festival takes place in Galway over the bank holiday weekend in October 2018. So if you fancy some great racing and great fun, then this is the place to be. There will be great racing, free car parking, free entry for children under 14, free racecard draw each day, big screen, Tote, On course bookmakers, bar and restaurant facilities • Admission Price: €15 per adult Music will be by the Guinness Jazz Band. Carnevil is the west of Ireland’s first scare attraction, housed above McGettigan’s Pub, in the old Cuba nightclub on Eyre Square. Carnevil begins in mid October and will end at midnight on Halloween night. The event is strictly over 16s. The Festival of Wild Atlantic Writing takes place in Doonregan, Cashel, Co Galway and celebrates publications inspired by the people and places along the Irelands beautiful Wild Atlantic Way. Held at the former home of Poet Laureate Ted Hughes, this stunning location will host a packed programme of events to suit every taste. Enjoy talks from established writers while exploring the rugged coastal with fellow literature lovers. The 7th annual Galway Masters International open Basketball Tournament will take place at NUIG Kingfisher in Galway on the first weekend of November 2018. Masters basketball denotes players must be over forty and thirty-five years old respectively for men and women, and the objective of this event is to promote competitive basketball for men and women and to offer players of various nationalities the opportunity to compete and socialise together over the two day event. Galway City is gearing up for the arrival of GamerFest, the biggest gaming convention to date in the west of Ireland. Taking place in the Radisson Blu Hotel & Spa this November, the event promises to be an awe-inspiring celebration of gaming and entertainment for it’s 2,000 visitors. The Spirit Of Voice festival will return in November with all aspects of song and spoken word are on show at An Taibhdhearc for a weekend of hip hop, sean nós, percussive chant, avant-garde electronic concerts and events celebrating song, words, and the human voice. Treat your children to an experience unlike any other and let them become Trainee Elves at Elf Town this Christmas. Santa will host this wonderful Christmas journey at the Galway Race Course in Ballybrit where he and his Elves have been very busy building Elf town. Conjure up the real magic and wonder of Christmas with Santa’s Christmas Magic at Brigit’s Garden! This year Elfie and Santa will be joined again by Mrs Claus to make a full Santa experience with the professional show as the delightful highlight of the day. The COPE Galway Christmas Day swim is now in its 28th year and is held each year on Christmas morning between 10am and 1pm at Blackrock, Salthill, Galway. Support COPE by taking a dip while and raising funds to help vulnerable and isolated men, women and families in Galway. The annual Christmas Day Swim takes place on Christmas morning at 11.30 am at the Long Point Loughrea. proceeds are in aid of CASA LOUGHREA in association with Loughrea Lions Club. The 13th running of the Fields of Athenry 10km will take place on St. Stephen’s day, December 26th at 11am. Over the last number of years this has has become of of the leading road races in the country, and this year it aims to raise the bar higher. The race returns to its now traditional route, finishing under the medival arch in Athenry. The 41st New Inn Mummers Festival, celebrating the music, song, dance, and storytelling of Irish culture, takes place in the New Inn Leisure Centre on the first weekend of January. Japanese cultural convention Akumakon brings the worlds of anime and manga to life for its annual celebration at NUI Galway. Oscar Wilde reminds us that although we are all in the gutter, some of us are looking at the stars. The Galway Astronomy Festival now in its 14th year, has become one of the most popular events in Ireland of the Iirsh astronomical calender, where amateurs and professionals meet, essential for exchanging information, successful stargazing and mutual progress. We look forward to seeing you, hopefully under clear skies. Baboró International Arts Festival for Children host the Wide Eyes Festival for infants and young children up to 6 years. This 4-day festival will see 140 arts professionals from 17 organisations and 15 countries taking part in shows for schools, crèches, and families, as well as professional development workshops and industry symposia. Celebrate the start of spring with a free Brigit’s Cross-making workshop at Brigit’s Garden in Rosscahill, Co. Galway. Rushes will be provided and you will be able to make your own traditional cross to take home. Please note that this start time is 3pm prompt. Galway International Rally, sponsored by Corrib Oil has a notable place in Ireland’s road racing history, as it was the 1st round of the Irish Tarmac Championship which was first held in 1978. Today, the rally serves as the season opener for the championship. The Kinvara Rock and Road Half Marathon and 10K is an running event starting and finishing in the scenic seaside village of Kinvara, Co. Galway. Up to 2000 runners will follow the route through some of the most beautiful areas of the famous Burren landscape. Mùscailt, meaning to celebrate and inspire is the title of the celebrated spring arts festival hosted by the National University of Ireland, Galway. The 18th Múscailt Arts Festival at NUI Galway invites all students, staff, alumni and the public to enjoy a week of art, music and performance on campus. Múscailt has something for everyone in terms of music, Sculpture and photography, theatre and all but one event is free! A mountain running event on unmarked routes in the northern Maamturk mountains in wildest Connemara hills with special permission to access these magnificent trails. 22km route for experienced mountain runners plus with a shorter 12km event to appeal to runners new to mountain running. The Biking Blitz is a mass start cross country mountain bike event, aimed primarily at beginners but with something for everyone. There are two distances, 16km and 32km and two categories, “Baggy Shorts” for beginners or “Super Pro” for more experienced riders, plus youth categories from U6 to U18. Mountain bike trail centres are used exclusively for these events to ensure a fast flowing course in all weather conditions. The Aran Celtic Music Festival takes place on the Aran Islands is showcases the best of Celtic music, song, dance and heritage and brings together prominent muscians and artists for a unique occasion in the beautiful setting of the Aran Islands. St Patrick’s Festival parade in Galway is a platform to showcase local artists and community groups. The parade starts at 11.30am and runs through Galway city centre for over 1 hour. The event aims to celebrate Galway’s diverse culture and talent through an inclusive programme of events. Expect many additional events to be held throughout the city over the bank holiday weekend. Cleasathon consists of a 16km, 10km or 5km road runs on Inis Oirr, the smallest and arguably most beautiful of the 3 Aran Islands. One of the three events is a new 16km adventure route, run over very rough terrain of rocks and boulders. The second 10km hilly route provides a significant challenge while the 5km is a little more manageable with a downhill finish. All three running events showcase the amazing scenery of the island.